Once more I ask you to understand that this post is not about the Crepusculum. The next post will once again address my feelings on entering my Crepusculum, but for now and for a couple more posts I will share with you my life as it is presently. You are invited to play “You Are My Sunshine” by clicking the audio button. This particular accompaniment is a recording by The Gene Autrey Band. Sing along please. The lyrics are slightly different than those originally written by Jimmy Davis and Charles Mitchell. I first sang my version to my Mother four years ago while she was in the Critical Care Unit, following a major stroke. It has become our anthem. When skies are grey, or purple, or pink…. Please be be my sunshine for all of my days. as much as I have loved you. Please be my sunshine for all of my days. I have taken nearly a lifetime to accept the simple reality that my Mother will die. Now I question, each day, will it be today, tomorrow or another day, but regardless it draws nearer and nearer. The daily changes are significant, particularly, when Momma becomes quieter and quieter and less willing to speak or even answer a simple question. Yesterday was the first day in three weeks that she interacted with me, but now today, stopped responding this afternoon. I don’t think that it is always in her power to communicate, even though there are times she can express displeasure very quickly. It is during her quiet times that a phantom meets me face to face causing me to be bewildered and and weak and then I realize how easily my nemesis reigns. Daily I watch and understand her unhappiness and feel the malcontent within her heart. I know that I would never be able to withstand the onslaught of degeneration she experiences and now I have begun to respond to that call and pray that I support her own orison that begs a speedy departure from this physical life. Her beacon shines bright toward heaven and as she waits quietly and serenely, I will support her appetency. In so doing, a few weeks, ago I wrote a poem embracing the idea of her departure. By writing I hope the words will soothe and strengthen me, particularly when my nemesis becomes overwhelming………. Lately, I also realize I must tell this incorrigible, phantom it will not win. I will support my Mother’s departure and I will repeatedly, read this poem because it came from deep within my heart and that its’ spirit will continue to minister a balm that will ease me into change. I have also begun to believe that Momma will be in a heavenly paradise where her spirit will no longer be plagued by her earthly pain and she will be able to be happy and be with everyone she loves that preceded her in death. There she will also be able to be my Mother, standing with open arms and a warm smile, as she welcomes my sister and I at our time. A friend suggested that I prepare myself now for a new identity, an updated life plan, where I will no longer be a caretaker/protector, but one that allows growth in my own life. I hadn’t really thought of this before because I intentionally blocked it from my thoughts. Now I can see how important a plan is and how it will form a bridge between here and where I need to go. As I have written before, my Mother’s wisdom shines yet to this day. One day, not long ago, my Mother spoke to my sister. She repeatedly told my sister that she was worried for her. Eventually, my sister reasoned that she was not speaking of her, but of me. She was concerned about my life following her death. Even so close to the end of her journey she expressed her concern for me. When my sister told me, I didn’t think much of it until I understood that she knew before me that I need to make new plans for my life. I may have acquiesced to Momma’s orison, but in doing so I realize how little time I have left to get ready and to be with her. And so I shall continue to write as much as I can to help me, but I also will spend as much time each day kneeling at her bedside, head to head so that my voice is directed straight to her ear; Momma will quietly lie there, I will babble on as usual and then, every once in a while Momma will respond and I will send that moment directly to my heart to be locked away and not forgotten. 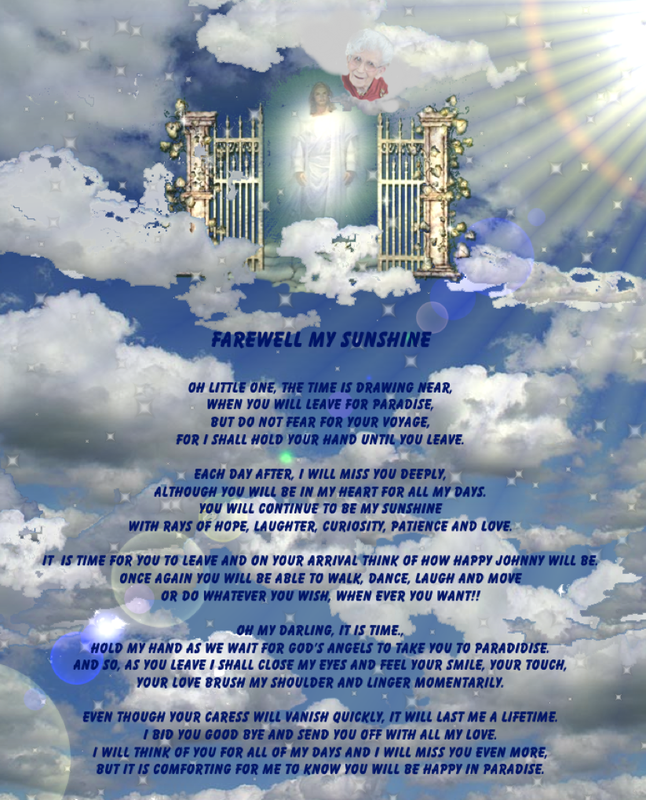 Posted on October 7, 2008 September 5, 2010 by suntithenaiPosted in acceptence, death, fearTagged letting go, mother, paradise, poem. I loved the Smilebox and the pictures…There is no doubt, your mamma loves you and she loves life. I noticed that no matter the “times”, your mother lived in the moment….What a special gift to give to you…. Thanks for sharing your memories and pictures, Frank..I loved them. I am amazed the things you can do in Smilebox–I once thought not, but never really tried before I sent that first card to you. You are so correct and even more astute than I, comparing you read about and I know my Mother, in that you see and now that she lived in each moment. I am so sorry that I never recognized all of my Mother’s attributes until I was older, but then I think the more time that passes for me or anyone, the more they begin to see. I hope I can be as adept as you are in adapting to your new life. I’m workin’ on it!! Your poem is lovely, and I know that it will give you comfort as you face the inevitable. The hope of Heaven, the joy of the anticpated reunion and the belief that she will become “Momma” once again are the cornerstones to begin building the life that will come after she is gone from this world. The photos of you and your mother show the closeness that she has always felt for you. Your mother has grown more lovely over the years…I think that is the glow of love and contentment. She has never had to fear what would happen to her; you have seen to her care with so much love and patience – I hope you know how precious that gift is to her heart. You are about to enter a new phase of your life, but your memories will continue to keep you company. The photographs will bring to mind all sorts of wonderful recollections of holidays, birthdays, vactions and every day life happenings. You will always have your Momma with you. I have to tell you that I think it is so special that you are still “Momma’s Boy”. That you have cared for her yourself rather than putting her into a nursing home shows the kind of character that you posses. I’m proud to be your friend, Frank, truly proud. I am truly blessed to have gotten to know you. Your heart is truly kind, understanding and caring. I shall remember your words in the last paragraph for the rest of my time, because you have taken the time to understand.